The iconic Curfew Tower in the centre of the village was built by the then landlord of the town, Francis Turnley, in 1817, to confine idlers and rioters. Dan McBride, an army pensioner, was given the job of keeper of the garrison and ordered not to leave it day or night. He was armed with one musket, a bayonet, a brace of pistols and a thirteen-feet-long pike with a cross on its handle so that it could not be pulled through the hole guarding the doorways. After McBride’s retirement he was replaced by a WW1 veteran with a wooden leg, despite which he was a keen tree climber, raised a large family in the tower and rang the curfew bell religiously. Remnants of this fortified past are evident in the windowless dungeon, the massively heavy entrance door, ‘murder holes’ below the oriel windows, and an old well at the back door. Niches in the walls beside the upper level windows almost certainly housed heavy shutters for the windows, and a curfew bell has been reinstated on the parapet (the old one was missing, and the present one formerly graced a London fire station). 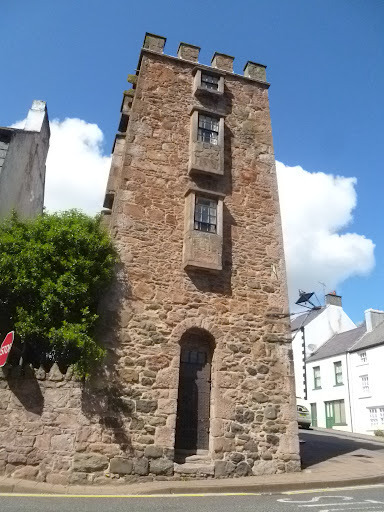 The Tower is 20 feet square, tapered, and rises four storeys to a height of 40 feet, topped by modest battlements; on each of its four faces there are projecting windows, with a murder-hole in the base of the lowest. It is built of a rich red sandstone rubble, one wall being slate-hung. In the base of the east wall is inset a modest fountain capped by Mr. Turnly’s initials. The doorway is narrow and round headed; the door itself is most medieval, sheathed in iron.